One of the machines that I always use when I visit gyms is their power tower. I used to think that power towers were all identical until I started to notice the difference in qualities of those in different gyms. So I started to do some research on the available home power towers in the market and boy was I surprised with my findings. There is more to power towers than meets the eye, so I took some time to really get into the detail and find the best power tower on the market today for the home gym enthusiast. My extensive research finally led me to the Weider Power Tower. If you just buy the first power tower you see based on price alone then you are destined for disappointment, particularly if you are going to be using the power tower on a regular basis. So stick with me here as I will be explaining each of these in relation to the Weider Power Tower. One of the most important factors when choosing a power tower is the structure and material of the tower. The tubular steel structure ensures that of the Weider power tower is sturdy and durable, strong enough to withstand a weight of up to 300 lbs. The weather resistant two-toned powdercoat finish also adds to the longevity of the equipment. The Weider power tower comes amply equipped with a solid back padding and forearm rest padding. The benefit of this feature is immediately evident when doing vertical knee raises because we won’t feel the grind against our backs and elbows as typically felt with lesser power towers. The cushioning is thick enough to cradle your forearms comfortably while you do your knee raises, while the back padding is long enough to support the entire curvature of your spine. The extended tricep dip bars gives you lots of room to maneuver when doing your dips, so that you won’t risk knocking your head on the pull-up section, or be hindered by the forearm rest pads. Also, the inclusion of the built-in push up bars is a very welcome bonus. This makes it pretty much an all-in-one workout station. How convenient! Have you ever experienced the awkwardness of having to jump up to do your pull up or dips, then jump off wobbly when you’re tired from doing your set? Though not a gigantic feature, the Weider Power Tower has 2 inconspicuous foot rests that’s positioned ideally for you to get into your starting position of each exercise. And when you’re done, these foot rests allow you to step down comfortably and safely. Hey, you can never be too careful to risk spraining your ankle! The Weider Power Tower is listed for sale at $249.95 but you really shouldn’t be paying any more than $150 for this exercise equipment. The cheapest we have seen it is on Amazon who consistently sell this fitness tool for under $130. This power tower has received rave reviews from most consumers on the net with an average of 4 out of 5 from most reviewers on Amazon. I found very few complaints for this training equipment on consumer sites around the internet. One consumer did express concern that he wasn’t sure if it was easily assembled. The good news is, it is very straightforward and only needs to be set up once. Where Can You Buy the Weider Power Tower? You can buy this Weider Power Tower from Amazon. At the moment they are giving a generous discount off this item and from what I can tell, Amazon does currently have the best deal. Click here to view on Amazon. 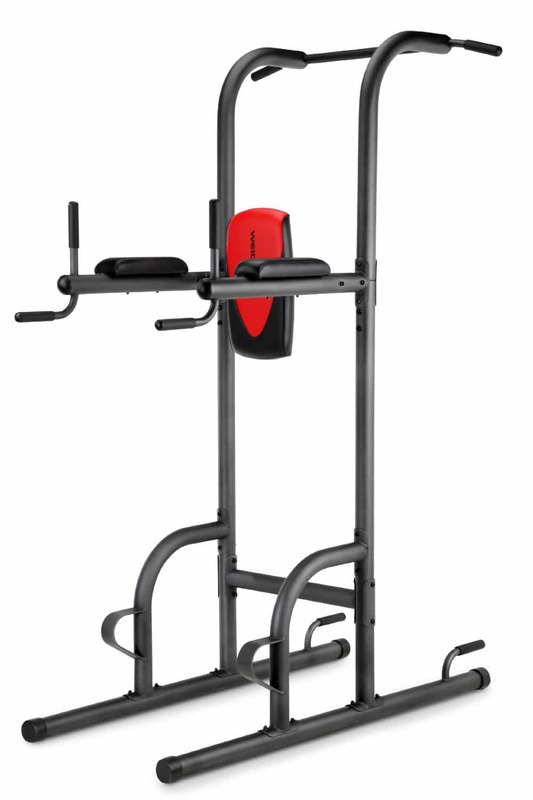 Where Can You Read More Reviews for the Weider Power Tower?